Former UFC heavyweight champion Stipe Miocic continues to pine for a rematch with Daniel Cormier despite multiple unanswered challenges. 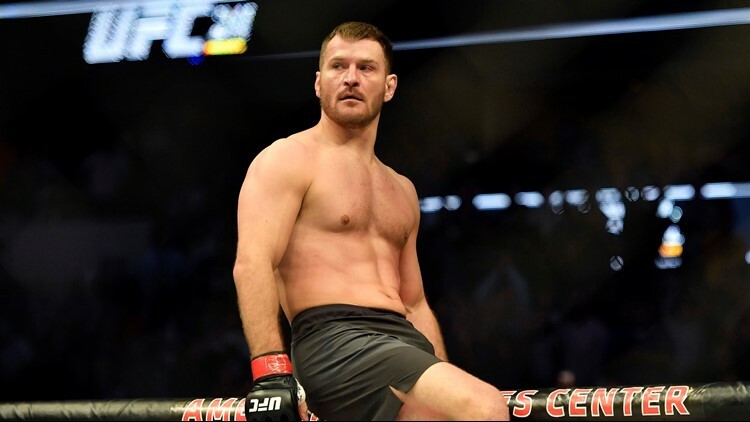 CLEVELAND -- Former UFC heavyweight champion Stipe Miocic is not happy with having to get in line for a rematch with Daniel Cormier, not with plenty of other fighters, namely Conor McGregor and Joanna Jedrzejczyk, getting title shots coming off of long absences/multiple losses. Miocic delivered that message, loud and clear, in his appearance on Ariel Helwani’s MMA Show on ESPN earlier in the week. “I deserve the shot,” the normally jovial Miocic told Helwani, flatly. “I don’t understand why I don’t deserve the shot. Former UFC champion Stipe Miocic continues his campaign for a rematch against two-division title-holder Daniel Cormier. Instead of fighting for the title, Miocic had to watch from the sidelines last Saturday night. 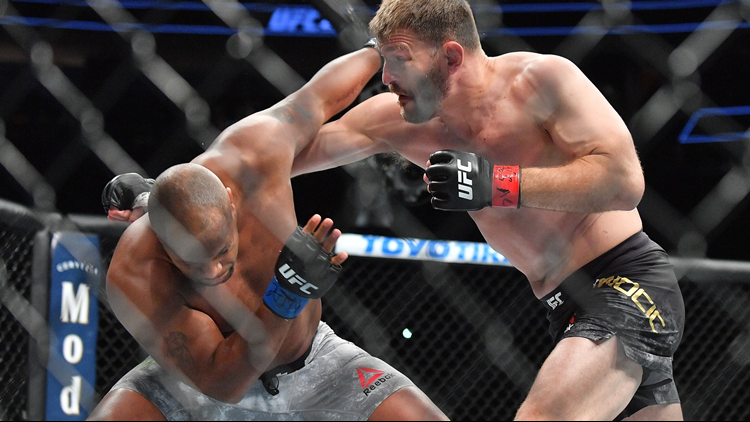 Miocic watched Cormier, who claimed he would have to be out of action until at least January of 2019 because of a hand injury, successfully defended the UFC heavyweight championship with a second-round submission of hard-punching, but conditionally-challenged Derrick Lewis in the main event of UFC 230 at Madison Square Garden in New York City. “Of course, it was annoying,” Miocic said. “I’m sitting there, and it should be me. There’s a ton of guys that never defend the belt, and they get title shots, rematches, but then, I defended it three times and I did them a favor. Admittedly, Cormier took the Lewis fight on short notice instead of a bout with Miocic because he thought it would be an easier defense instead of facing a multi-faceted opponent with the motivation to get back the heavyweight championship. “100 percent,” Miocic said when asked if he would have taken a rematch with Cormier with only three weeks’ notice. “I want my belt back. That’s my belt. 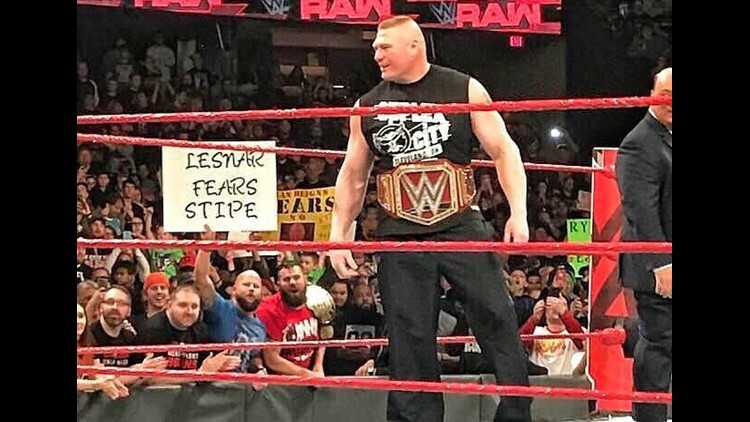 UFC heavyweight champion Stipe Miocic appreciates the love he got from a WWE fan during Monday Night Raw in Cleveland. For the second straight bout, Cormier used his post-fight interview inside The Octagon to challenge former UFC heavyweight champion Brock Lesnar. Lesnar has not fought since earning a decision victory over Mark Hunt at UFC 200 in July of 2016, only to have the decision overturned when he failed a post-fight drug test. Subsequently, Hunt has had legal issues with the UFC over the bout. Currently, Lesnar is the WWE Universal Champion, a belt he “won” at the controversial “Crown Jewel” event in Riyadh, Saudi Arabia last Friday night. “He gets popped all the time,” Miocic said of Lesnar. “What’s the deal? “I don’t understand how you’re going to give a guy who hasn’t done anything in two-and-a-half years, who’s on suspension…I don’t know. It irritates me more than anything because we have all these other fighters. We’re clean, we train hard, where he hasn’t done anything in two-and-a-half years, gets popped twice, and all of a sudden, he’s getting a title shot.